Pastel painting has enjoyed great popularity for centuries, uniting drawing techniques with an intense colour effect. 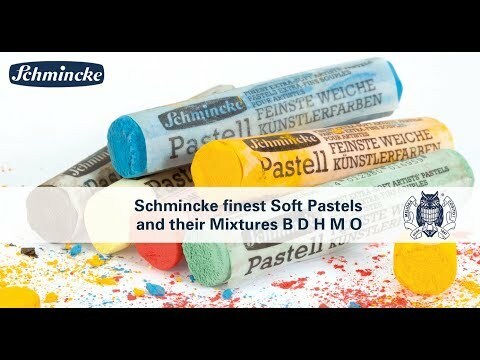 The extra-fine pastels by Schmincke are as soft as velvet and silk with a particularly soft and intense colour application as a result of their formulation and the traditional production technique. The colour spectrum of 400 shades allows limitless artistic possibilities, whether used in their pure form on specialist pastel paper, in mixed-media techniques or also - on the special Schmincke primers - on canvas. A professional range of fixatives ensures that the observer can also enjoy the unique results over a long period. Working with Schmincke pastels leads you back to the origin of colour. Our round sticks consists only of the finest artists’ pigments (without chalk!) and a minimum amount of binder. The binder content is so small that the medium-find ground pigments only just achieve a stable bond. The unusual formulation, which guarantees a unique strong colour application, also requires an equally unique production process: Traditional Craftsmanship. In this traditional and time-consuming process, screw presses are used first to shape the pre-kneaded dough into round strands, which are then removed by hand and cut into the right length in wire-strung frames. The sticks are still damp and are left to dry in the air for 8 days before they are labelled by hand. It is not possible to produce our pastels using machines because of the particularly fine formulation - the expensive sticks could break. The guaranteed consistency of quality and softness across all production cycles is crucial, which means that artists know that the colour will always have the same quality. The complete range includes 400 colour shades, divided into 75 colours which each have 5 grades: In addition to the pure colour (D), there is a black graduation (B) and 3 grades of white graduations (H, M, O). The balanced range is supplemented by a 10-step neutral grey series, 5 dark shades, gold, silver, 2 black shades, white and 5 special pearlescent shades for specific effects. 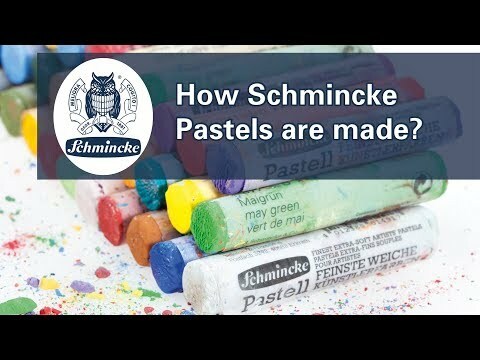 This variety of colours is another sign of quality of the finest, extra-soft pastels by Schmincke. Pastels should only be sprayed with specific fixatives (such as the Schmincke pastel fixative No. 50402) - used sparingly.